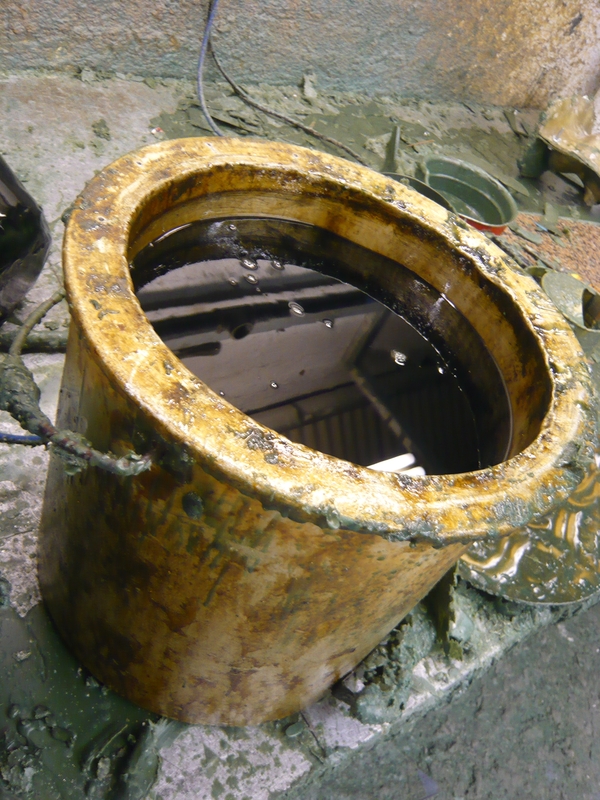 How exciting – I get the call from the foundry to say it’s time to go and check the wax prior to their making the ceramic shell and bronze casting (the hot molten stuff!). 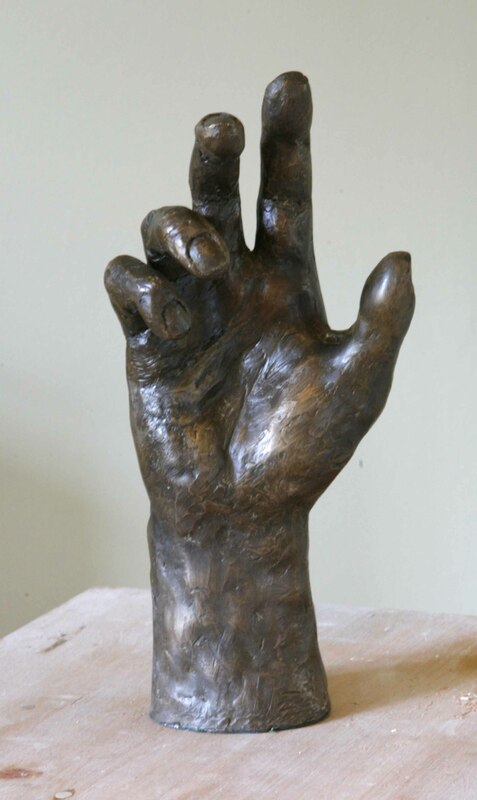 (This is for a hand portrait sculpture which I was commissioned to do in bronze). Quick call to Andrew Sinclair (who introduced me to the foundry) to find out exactly what this means (!) and off I go. Turns out by the way that checking the wax is pretty much exactly that – you have to check that you are happy with the wax positive version of the sculpture before anything else happens. This meant softening some seam lines by trimming back the wax slightly, but otherwise all was ok. In fact I think the green wax version looks pretty cool…. 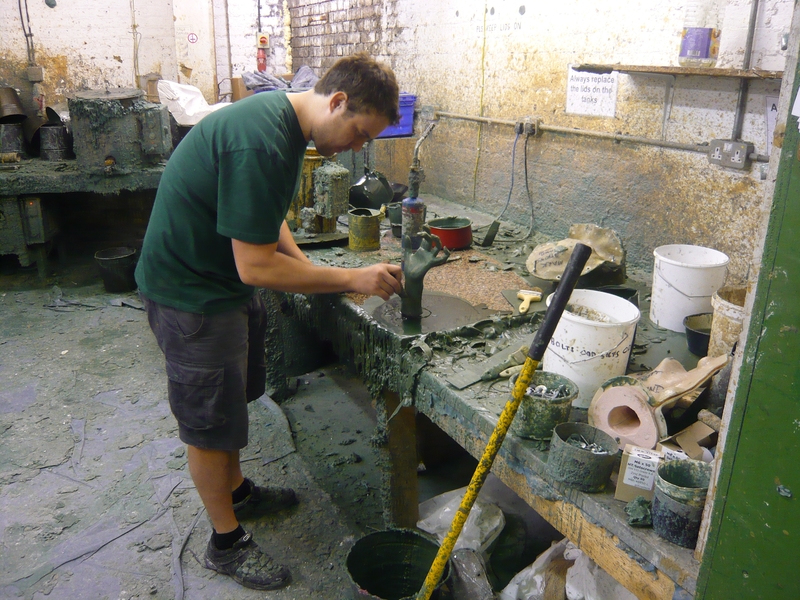 It might be useful for me to summarise the various stages in the moulding and casting process for bronze as it’s very complicated and heavily labour intensive – no wonder foundry cast bronzes are so expensive (and that’s without thinking about the actual cost of the bronze itself). This is my interpretation of the process so it may not be 100% but does give an impression…. 1. 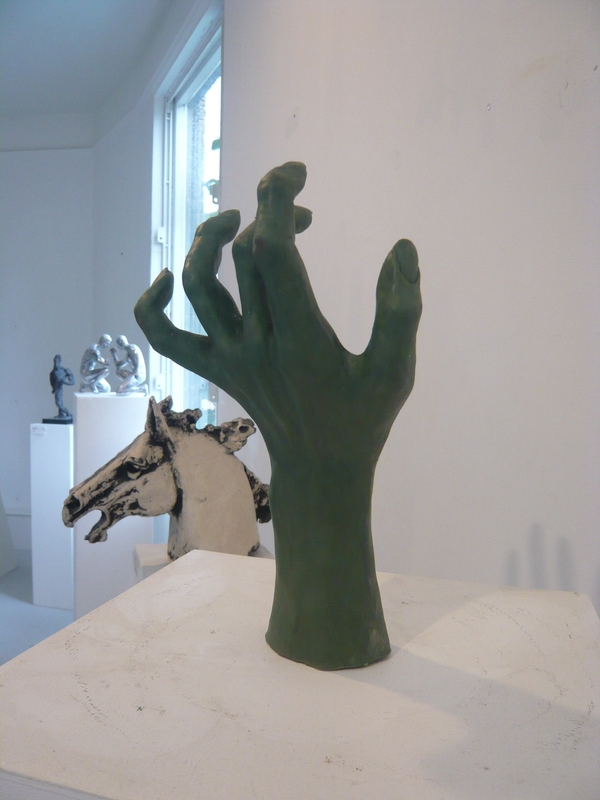 The clay version of my sculpture is used to make a standard mould – rubber lining with resin jacket. This in itself takes several days. 2. 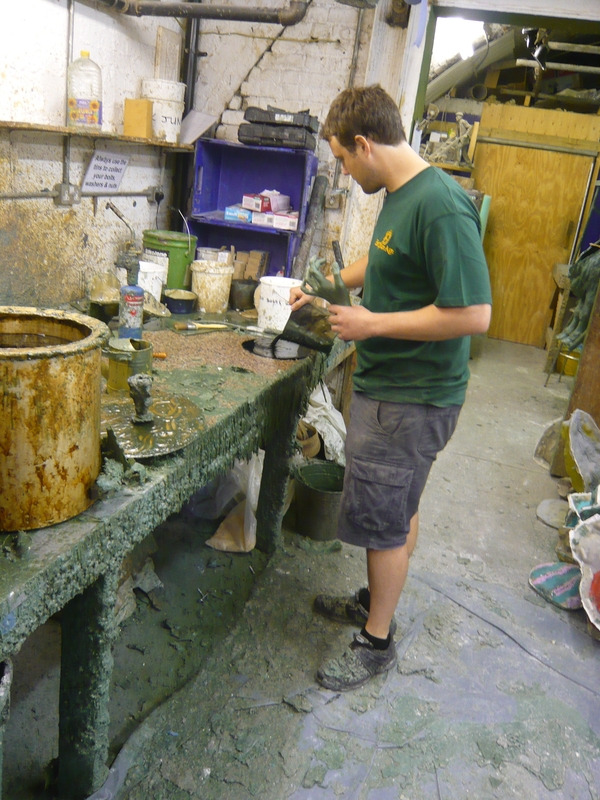 The mould is used to make a wax positive version refered to above. This wax is hollow as the bronze itself also has to be. 3. 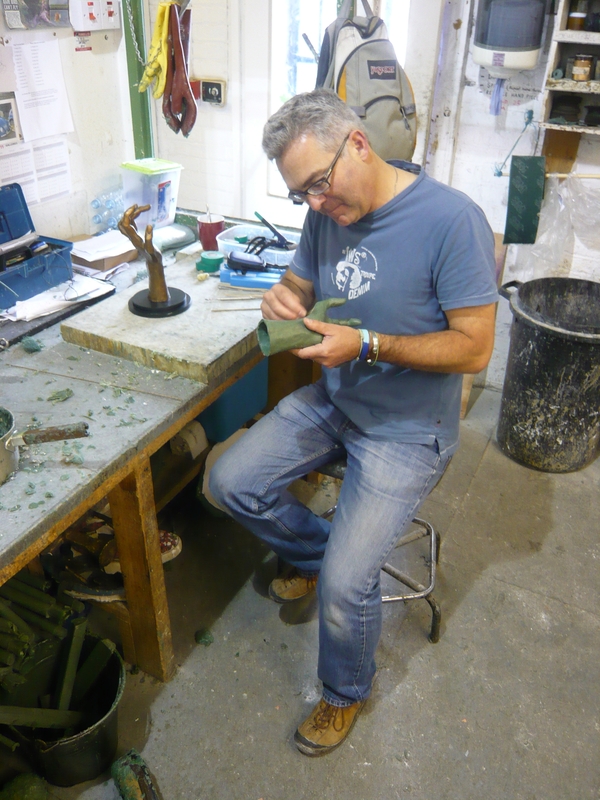 The wax is taken and a ceramic shell made from it – lining both the inside and the outside. Again a time consuming process involving numerous layers of ceramic and the incorporation of pour and flow channels for the molten bronze. 4. The wax is melted away leaving only the ceramic shell to take the bronze. The shell is buried in sand and the molten bronze poured in. It’s allowed to cool over night. 5. The shell is broken away to reveal the bronze. This has to be tidied up and then the final patination undertaken – another art in itself! Some of you will have realised that once one version has been made, to make another, the whole process has to be started over from 2. above as the wax and the ceramic shell are lost in the process. I was made very welcome and even treated to a tour of the foundry – fascinating stuff! It’s hard to believe that places like this still exist – it’s literally like stepping back in time as the processes are little changed over the last few hundred years. 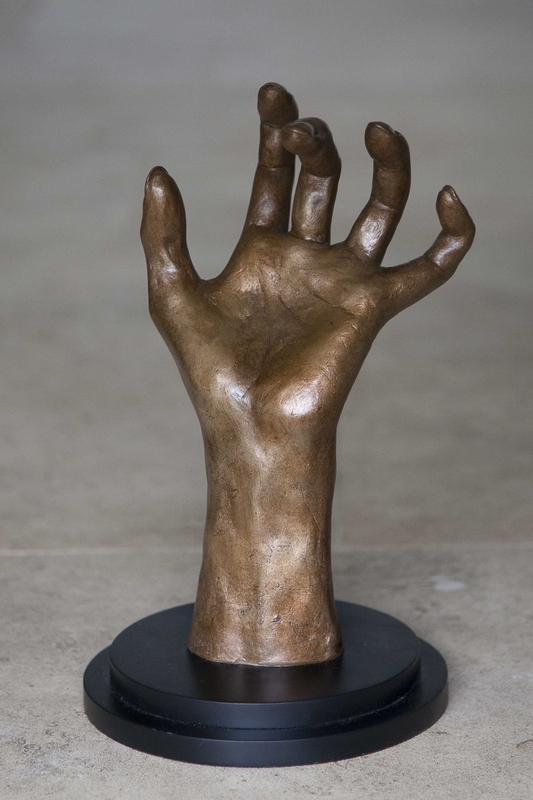 Followers of this blog may recognise the hand as it was one of my successful entries to The Chelsea Art Society 64th Exhibition last month – this was the cold cast bronze (bronze resin) version named Hand Study (below right). My client had seen another hand which I had made (called I am The Light, below left) and wanted me to sculpt a version of her own. Apparently she had always wanted a bronze and soon she will get one! 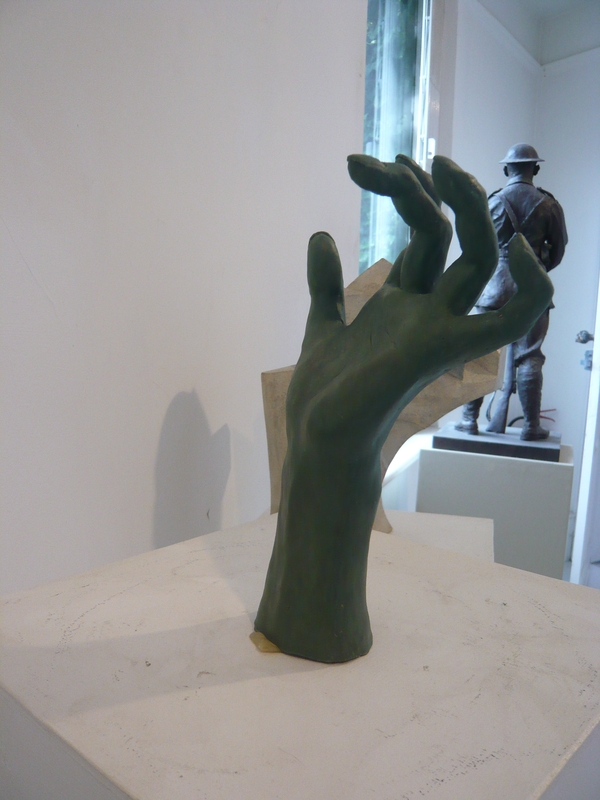 This entry was posted in art exhibition, figurative sculpture, gary scott blog, hand portrait, sculpture blog, Uncategorized and tagged art exhibition, figurative sculpture, gary scott, gary scott sculptor, gary scott sculpture, hand portrait, sculpture exhibition. Bookmark the permalink.